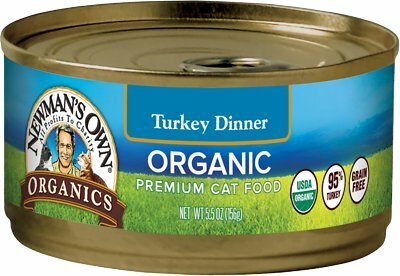 Turn meal time into nutrition time for your kitty with the Newman's Own Organics Grain-Free 95% Turkey Dinner Canned Cat Food. 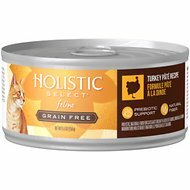 Made with real organic turkey as the first ingredient, plus broth, eggs and fiber-rich alfalfa, it’s all the grain-free nutrition your furry one needs with all the flavor he’ll find irresistible. Your pal will love the juicy pate while he gets all the nutrients he needs, including essential amino acids like taurine, plus vitamins and minerals. It’s great as a complete and balanced diet for cats of all ages and even kittens, and can be used as a meal on its own or a delicious kibble topper. Plus, the broth is a great way to add much-needed hydration to your cat’s diet, and contains no wheat, corn, artificial colors, flavors, or preservatives. 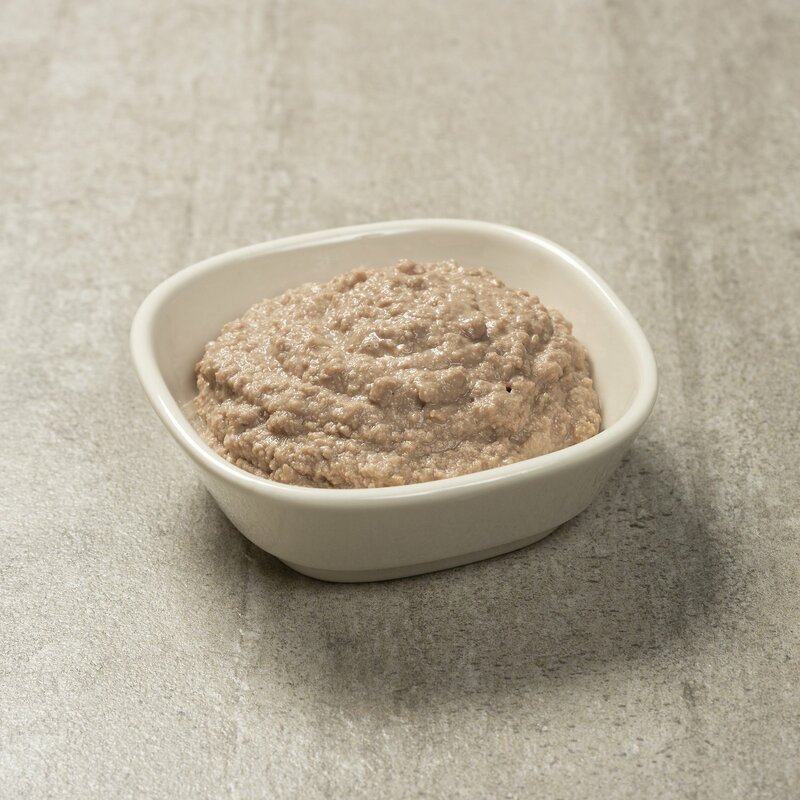 Grain-free pate is made with 95% real organic turkey as the first ingredient, plus eggs and fiber-rich alfalfa. With essential vitamins, minerals, plus taurine, an amino acid cats need for optimum health. Provides a complete and balanced meal for cats of all ages and kittens with a pate recipe even picky eaters will love. Great as a meal on its own or a delicious topper for dry food; comes in an easy-to-open can. Moist recipe is a great way to add hydration to your cat’s diet; made in the USA with no corn, wheat, artificial colors, flavors, or preservatives. Organic Turkey, Organic Poultry Broth, Organic Dried Eggs, Organic Yeast Extract, Organic Suncured Alfalfa Meal, Potassium Chloride, Organic Guar Gum, Carrageenan, Choline Chloride, Taurine, Calcium Carbonate, Dicalcium Phosphate, Salt, Magnesium Proteinate, Zinc Proteinate, Iron Proteinate, Niacin Supplement, Vitamin E Supplement, Copper Proteinate, Sodium Selenite, Thiamine Mononitrate, Manganese Proteinate, Vitamin A Supplement, Calcium Pantothenate, Riboflavin Supplement, Pyridoxine Hydrochloride, Biotin, Vitamin D3 Supplement, Vitamin B12 Supplement, Ethylenediamine Dihydroiodide, Folic Acid. The amount of food fed depends on the age and size of your animal. Generally, puppies and kittens should be fed 3 - 4 times a day until about 6 months old. Reduce the number of meals to 2 per day after 6 months of age. Use the feeding guidelines on the package, however each animal is an individual and you should observe your animal to see if your feeding amounts is causing weight gain or loss and then make the necessary adjustments. Whenever there is a change of diet, its advisable to slowly introduce the new food by mixing it into the food currently fed. We recommend mixing Newman’s Own pet foods with your current pet food over a period of approximately 2-3 weeks to guarantee that your cat’s digestive system adjusts to the new food. It is important to remember that Newman’s Own pet food ingredients such as fresh natural chicken and organic brown rice, being whole foods, may be richer and may be more nutritionally concentrated than your current food. We always recommend that you contact your veterinarian if your animal has persistent digestive upsets. Are your pet products thoroughly tested? Yes. All of our pet products are manufactured to the highest standards of quality control and samples are obtained during each production run for analysis and retention for additional evaluation. Is there any animal testing involved? No. The only analytical testing done is in a laboratory where animals are NOT allowed. We do "taste testing" with animals awaiting adoption in a local humane society shelter. 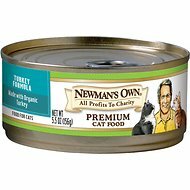 Can I mix Newman's Own canned foods with dry foods? Yes. Canned foods are a great way to add a little variety and "extra" taste to dry foods. Carrageenan is a seaweed extract common in the Atlantic Ocean near Britain, Continental Europe and North America and used as a thickening agent in place of animal-based products like gelatin, which is extracted from animal bones. Seaweed is boiled to extract the carrageenan, and in that sense, carrageenan is completely "natural" and not much different from tomato in its creation. What Is Taurine and why is it important for my cat's? Taurine is an essential amino acid for cat's that is found in meat protein. It is a dietary requirement for a good eyesight, heart function, digestion (production of bile salts) and proper reproduction. Taurine is essential in cat's because it is required by the heart and eyes however it is neither manufactured nor available in the body. Therefore, cat's need meat to fulfill this requirement (obligate carnivores), as Taurine is only found in animal proteins such as chicken. High quality - high nutrition cat food! 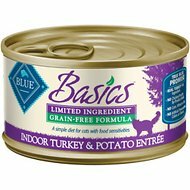 This is the only food my cat doesn’t throw up. He is on a urineary diet of dry food and we like to give him a tasty treat and this has worked well for him. It doesn’t look appetizing and I wish there was a little more in the can but all 3 of my cats love it. I wish there were an assorted pack in different flavors or at least 6 packs so you could mix and match for variety. Two out of five love it!! The consistency is a little more moist than a lot of pate foods, which I like (part of the reason I feed my cats canned food is for the extra moisture). Only complaint is that the food contains carageenan. But overall, it's a much healthier option than many others and really love that it's organic! My cats liked it too. Finally found a food they mostly liked, and then the price goes up $12/case. They didn't like the turkey as much as the chicken, and lately they haven't even liked the chicken, so maybe it's a good thing that I can't afford to feed my cats this food. Neither of my cats would touch this food! They acted like there was no food in their food dish! I had to mix tuna in so that they would eat it while waiting for their preferred food to be ordered and delivered but that only worked the first day! My cats absolutely love this. It's a little thin, more like a mush, but the cats lick it up. I used to give them the Salmon dinner, but I tried this when the Salmon was out of stock. I'm now sticking with this. Are cats don't like this kind. This is the only one they don't like. We ordered 6 other kinds so far they like them we have 7 cats.